One morning I was soundly asleep when I got an sms from our client which reads, "Your photos of our wedding was featured in Metro Ahad 20th May 2012 and they even mentioned Jet Fynn Photography there. Its the best wedding anniversary we've ever had. Thanks 2 U....."
And to think that this couple had already been married for 4 years and with 2 kids! 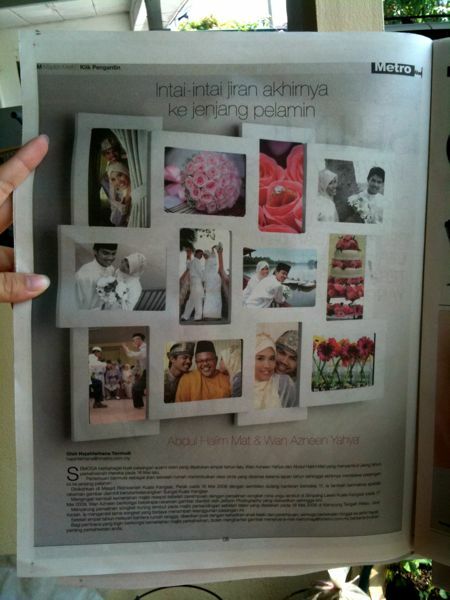 I'm very happy for Halim and Azneen too! Great anniversary present! Hi Minho.. Its been 8 years now and still counting. I saw this post in google why 'googling' some images. hahaha what a forever memory. I knew I have chosen the best photographer ever! !Thank You MinHo n Jetfyn Photography. Long life to you amin.